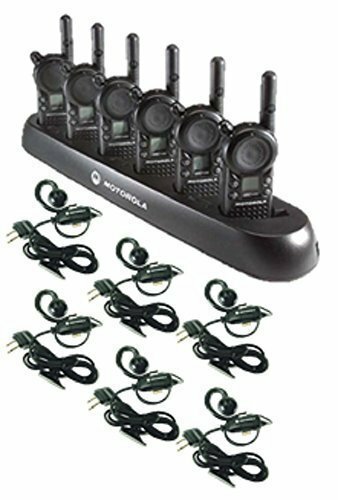 Six-pack of Motorola CLS1410 radios complete with C-shaped earpieces and a 6-bank charger. Each of our radios comes complete with a single-unit charger, 18 hour lithium ion battery pack and swivel belt holster. Each radio is 1-watt, 4 channels (communication groups), UHF frequency range. Each of our radios comes complete with an earpiece, single-unit charger, 18 hour lithium ion battery and swivel belt holster.